Many of the materials and processes associated with creating art can be dangerous to the artist and those close to the artist. Learn about these dangers and then take steps to reduce or avoid risks associated with creating your artwork. Learn how to use your tools safely and only for their intended purpose. 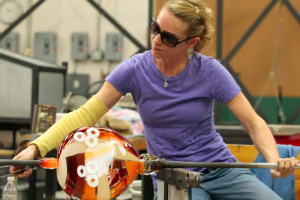 Visit other artists in their studios and see what they do to keep safe while working. Wear your personal protective gear (respirator, face and eye protection, hearing protection, etc.) when appropriate to the task. Proper sitting and standing practices for the back and neck. Proper handling of tools to keep hands and wrists in good condition. Proper ambient and task lighting to care for the eyes. Take care of your space. Take time to clean up.